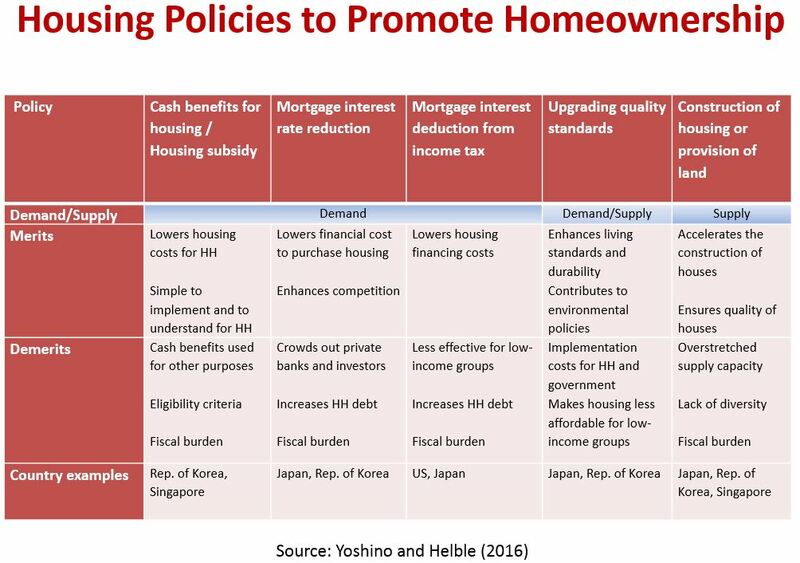 The Unassuming Economist | Housing Policies: What Works? The Housing Challenge in Emerging Asia: Options and Solutions is an excellent new book that has just been published by the Asian Development Bank Institute (ADBI). In this issue of the Global Housing Watch Newsletter, Jera Beah H. Lego interviews Matthias Helble, one of the editors of this timely new book. Lego is a Research Associate, and Helble is a Research Economist. Both are at the ADBI. Jera Beah H. Lego: The urbanization rate in Asia is nearly 50 percent, with more than 2 billion urban dwellers. About 127,000 people flood into cities every day and the number is rising. What are the challenges for policy makers? Matthias Helble: These numbers mean that the housing stock in urban areas needs to be continuously expanded, and this has huge implications beyond housing. For example, every household needs to have access to clean water, sanitation, and electricity. New dwellings need to be connected to roads and, if possible, public transportation. New neighborhoods should provide access to health care, education, and jobs. Urban safety and crime prevention need to be ensured. Climate change adaptation and mitigation measures also have to be integrated into the planning process. Jera Beah H. Lego: How have advanced economies confronted the challenge of housing an increasing urban population? 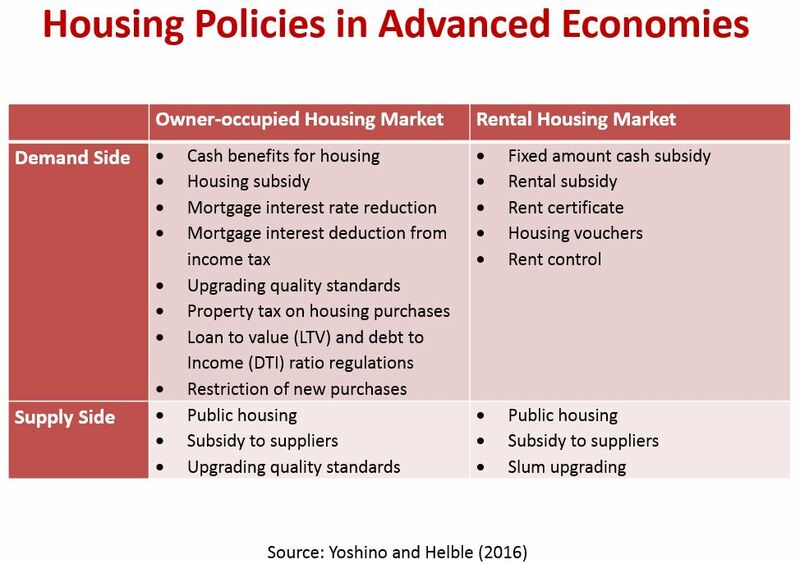 Matthias Helble: They have experimented with policies targeting both the supply and demand side of rental housing and homeownership. On the demand side, they have eased access to homeownership of low-income groups, typically through direct cash transfers or indirect subsidies such as mortgage guarantees. Success, however, has been mixed, as supply often proved to be inelastic. On the supply side, governments have controlled rents. However, rent controls often reduce the supply of rental housing as it becomes a less attractive investment. Consequently, the rental market becomes tighter, with landowners preferring high-income tenants. So even advanced economies struggle to achieve change. Jera Beah H. Lego: Many parts of the world have housing shortages. Which countries have successfully dealt with them? Matthias Helble: The public sector has had a major role in providing affordable and adequate housing in many countries. For example, postwar Japan used a three-pillar approach. One, it established the government Housing Loan Corporation to expedite housing construction. Two, it built rental houses for low-income groups. And three, it provided large-scale supply of residential land. Housing stock was restored by the 1960s. South Korea followed a similar strategy in the 1970s by expanding land supply and providing more housing loans. But government interventions couldn’t meet increased demand and prices went up sharply in the late 1980s. 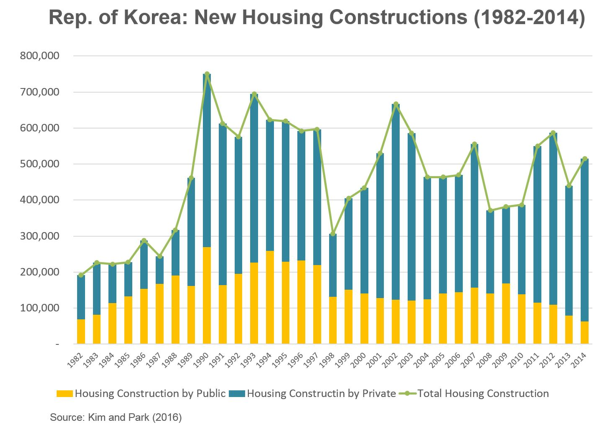 In response, the South Korean government expanded its housing programs with the Two Million Housing Drive and eventually curbed the property prices. Since then, South Korea has been relatively successful in containing price surges and avoiding real estate bubbles. These policies are based on the idea that the public sector must supply land, the market should be allowed to solve housing problems, and government regulations must ensure that low-income groups can access adequate housing either through rent subsidies or housing finance. Jera Beah H. Lego: You point out that from the 1950s to the 1970s, supply-side policies were common. Why did many countries switch to demand-side policies in the 1990s? Matthias Helble: One reason was the belief that the supply side is elastic and will respond to increased demand. However, this did not often occur because the housing market depends crucially on the government to remove supply constraints such as unclear land titles or a shortage of land. Another reason was that demand-side policies are easier to implement. It is often much easier to stimulate demand using various types of subsidies rather than removing supply constraints, which can be administratively and politically costly. Jera Beah H. Lego: The book points out that there is not enough housing finance available in Asia. Other studies have also pointed out that the mortgage market is small in developing and emerging countries. Why does housing finance remain elusive? Matthias Helble: Large parts of the population still have limited or no access to financial services. Households that do have access to banking services often don’t know how to use them. Financial inclusion and education are essential. Many commercial banks see housing finance as a risk because they often find it difficult to establish creditworthiness and to foreclose property. Governments have to both ease people’s access to finance and provide an environment that will make commercial banks eager to loan to would-be homeowners. Jera Beah H. Lego: To stimulate housing demand, the US uses mortgage interest deduction while the UK uses the Help-to-Buy scheme. Is it correct to say that very little is done to stimulate the rental housing market? Why? Matthias Helble: I would not say that very little is done, just relatively little. In both countries, the mantra of homeownership persists, which has advantages such as encouraging accumulation of a physical asset. However, homeownership is expensive, lowers labor mobility, and comes with risks like over-borrowing. Governments should therefore encourage tenure choices such as co-housing and community land trust. Jera Beah H. Lego: In the book’s case studies, what is the most common policy for promoting homeownership and the rental market? Matthias Helble: Many countries have experimented with easing mortgage financing, using either direct cash transfers or indirect subsidies like mortgage interest rate reduction. However, mortgage interest reduction in the US shows that a policy aimed at low-income groups can benefit high-income earners instead. 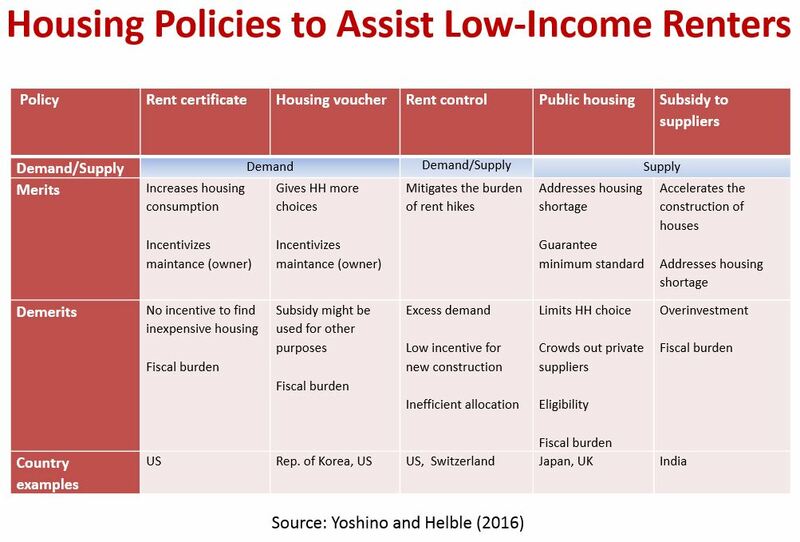 In Japan and the UK, the rental market was stimulated by providing public rental housing. Another policy is providing subsidies to suppliers of new housing, as in the case in India.